Omar Eliwa stands inside Welltopia, the pharmacy he recently opened in Thiensville which combines medications with supplements and an emphasis on personalized service to enhance patient results. 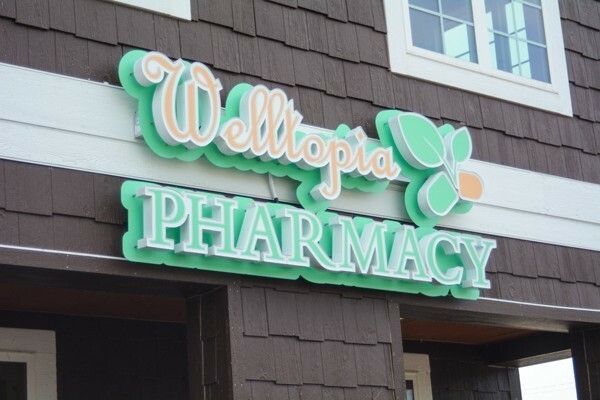 THIENSVILLE (USA) – You might expect to find the just-opened Welltopia Pharmacy along a narrow shopping street in Italy, rather than smack-dab in the middle of downtown Thiensville. “It’s something unique and different that Wisconsin hasn’t seen before,” said pharmacist and owner Omar Eliwa, who is putting the finishing touches on the pharmacy that is part of the Thiensville Health Alliance building, 136 N. Main St.
A visitor to the store is met by well-lit shelves displaying pharmaceutical-grade supplements and vitamins. New Age music plays softly in the background. The pharmacy counter is toward the back. A compounding lab, which still was being completed the week before Christmas, will round out Welltopia. “Our focus in in giving the customer the best experience when meeting with a pharmacist,” said Eliwa, who earned his pharmacy degree in Egypt and previously worked for Hayat Pharmacy, an independent chain in the Milwaukee area. Eliwa said he had a plan to develop a business that would permit closer interactions with customers and health care providers than typically is available in the national chain stores. He got acquainted with Dr. Gary Lewis, who started the Thiensville Health Alliance with an aim toward providing integrated health services under one roof. He said Lewis reached out to him and asked him to join the others in the building. The Franklin resident, who said he initially wasn’t all that familiar with exactly where Thiensville was, said he has found there are synergies that benefit his business as well as Dr. Lewis’ practices. “Like minds attract each other,” he said. 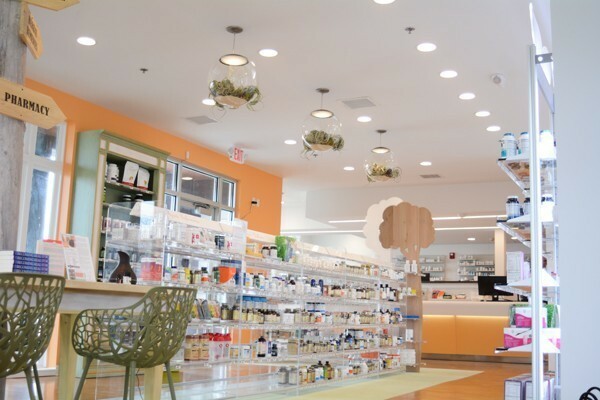 The interior of Welltopia Pharmacy in Thiensville was designed by an architect and interior designer from Italy. The shelves of the pharmacy include pharmaceutical-grade supplements. Eliwa said his main goal in opening Welltopia was “to do it right.” He did that by spending the past two years planning the business. He attended conventions and seminars to make the connections necessary to choose the right brands of supplements. The business was designed by an architect and interior designer from Italy. He said he takes pride is providing one-on-one service to customers and working in tandem with their health care providers. The store is designed to have a more welcoming and inviting atmosphere — much different than what he called the “in-and-out” experience most customers have when they drop into a big chain to pick up a prescription. Integrating supplements with prescription medications is a big part of Eliwa’s practice. He said consultations with customers can offer advice on foods that can be taken — or avoided — along with prescribed medications. Welltopia Pharmacy is located on the ground floor of the Thiensville Health Alliance building. Pharmacist Omar Eliwa said he is working in tandem with Dr. Gary Lewis, who developed the project and practices medicine there. For instance, he said a particular vitamin might make sense to take with some drugs. A probiotic can help keep things on track when taken in tandem with an antibiotic, he added. Welltopia’s just-opened compounding lab provides an opportunity to work with other medical professionals to find solutions for what he called complicated cases. Eliwa added that Welltopia offers a variety of personal services including sit-down consultations, in-home consultations with elderly patients and packaging medications in ways that help achieve better compliance from patients in taking the drugs.